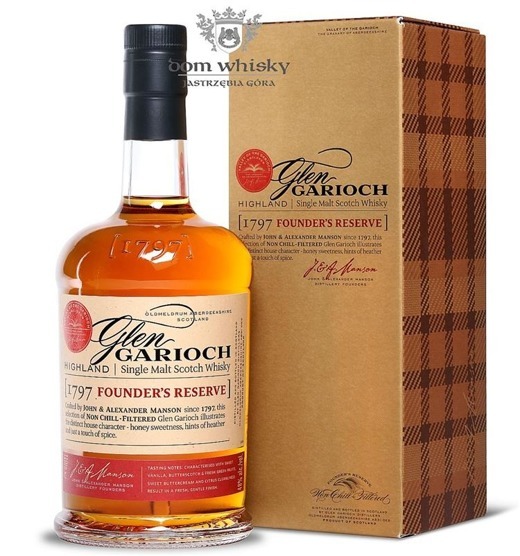 Glen Garioch 1797 Founder’s Reserve debuted in 2009, the year when the distillery revamped its entire range. The bottling is a tribute to John and Alexander Manson, the distillery founders (the early history of Glen Garioch is little murky, some sources claim that the distillery was funded by Thomas Simpson and sold to the Manson brothers around 1840). The whisky doesn’t carry age statement; it was aged in white American oak barrels and bottled at 48% abv without chill-filtration. Glen Garioch Distillery is currently owned by Beam Suntory and equipped with three stills (one has not been used for a long time) can produce a little over a million liters of spirit per annum. Nose: sweet and quite fruity, vanilla, honey, butterscotch, lemon peel, pears, apples, hints of white pepper, cinnamon and oak. Palate: vanilla, honey, caramel, buttered toast, sweet cereals, apples, honeydew melon, walnuts, pepper, allspice and oak. Finish: medium long, with notes of green apples, vanilla, caramel, milk chocolate, mixed nuts and oak.